How can you select a best free arm sewing machine? Free arm is the extended housing of sewing area, where you can find the needle, bobbin, feed dog and shuttle, etc., clubbed together as a unit and the extended portion will have space beneath it, allowing the fabric easily move around the extended portion and allows to stitch the area cylindrically. A sewing machine comes with bottom lifted extended housing of sewing unit, where the needle, bobbin, feed dog and shuttle, allowing the sewer to stitch difficult areas, where cylindrical sewing is essential is free arm sewing machine. The sewer can conveniently move around the fabric stitched cylindrically, by putting the cylindrically stitched fabric like a sleeve around the extended arm. It is beneficial for sewing end portion of pants, collar, cuffs, and other difficult areas, where the fabric already stitched in a tube shape. The sewer has to simply move the tubular-shaped fabric and allow for stitching around the fabric. The main benefit of a free arm sewing machine is, it make difficult area stitching area easy. When we say difficult areas, it is those areas where it’s hard to sew to do straight stitch and sewing around the fabric warrants. For example, if you want to sew around the armpit or collar or handcuff or end of the portion of pants, where the fabric required around sewing, it is better to have a free arm sewing machine. It is exclusively better, where the one side of the fabric already stitched like a pipe shape. It may not be possible to sue around on small cylindrical stitched fabrics. The opening area should have at least more width than of the arm circumference. Free arm sewing machines are good to work on cuffs, collars and small areas where it is essential to have sewn around work. Free arm sewing machine has no advantage for straight stitching. Sewing machine with free arm features will have less work area to accommodate the tubular clothing when required to stitch around by putting it in a sleeve around the extended arm. Most of the free arm sewing machine comes with snap off type plates, which you can fix and remove the way how you want to use. While doing straight stitches, you can snap on the plates which will work as an extension of the work area, allowing you to straight stitch easily. Similarly, when there is a need for cylindrical sewing, you can remove the snap plates, allowing to perform the tubular stitch around work. Free arm options are beneficial when you do sleeve bottom or end portion of pants stitching. What you have to do is to just push the tubular fabric like a sleeve on to the extended arm and start sewing normally. You will have a better result, acceptable stitching practice and better shape of the finished dress. Free arm stitching feature is extremely beneficial if you have regular sewing to do in tough areas. Even without a free arm sewing machine, you can do the difficult area stitching with lots of effort. A sewing machine that does not have free arm features, you need to keep the whole cloth around the shank of the sewing machine. The fabric will be covering the shank of the machine, and you do the stitching carefully. Until the invention of free arm sewing machine people used to manage with tricky stitching. Like all portable sewing machine, free arm sewing machine is convenient to store. You don’t have to earmark a dedicated space to store the machine. By just covering the machine, you can conveniently keep the machine in the corner of the room or closet. The main disadvantage of free arm sewing machine is the limited work area. Since the housing area of the sewing portion extended leaving space beneath the housing, allowing the cloth to move around the housing, and make the cylindrical stitch more convenient, the work area designed to the minimum possible area. The short work area will hinder straight stitch job, and you need to go extensible plate to generate more work area. Except the extended stitch housing, where the bobbin, needle, feed dog and shuttle, etc., are positioned in a sewing machine, you need to take care of all the essentialities required for a sewing machine. You can decide on the number of built-in stitches, needle position, thread cutter, bobbin winder, bobbin placing, auto re-winder, etc., as per your project requirements. Similarly, you can decide whether you need an entry level sewing machine or advanced sewing machine. All these features do not matter with the free arm sewing machine. When you are particularly interested in free arm sewing machine, go for a sewing machine that has the minimum housing extension. The extended housing should have a maximum length, minimum width, and minimum height. So that the extended housing can accommodate cylindrically stitched fabrics, which are relatively in small sizes. Long extended housing is suitable for quilting. Make sure to have removable plate attachments. The snap on plate allows extending the size of the working table when you don’t have any free arm stitching jobs. Similarly, when you have cylindrical stitch around jobs, you can snap of the plates and make it ready for circular stitch. In some machine, you will have the accessory tray fitted with the extended housing. When you have a project that required stitch around features, you can remove the accessory tray and use the sewing machine your projects. In the following article, we shall be introducing 3 SINGER free arm sewing machines and 3 Brother sewing machine with free arm features. SINGER 7256 is the most versatile free arm sewing machine with 70 built-in stitches. The machine is computerized and comes with free arm features. The sewing machine is ideal for fashion enthusiasts, in particular for newbies. The machine comes with LED work area lights, comfortable push-button stitch selector, top drop-in bobbin feeder, automatic needle cutter, etc. Another advantage of the machine is its automatic stitch length, and width adjustment features help explore the creativity of the sewer. The built-in stitch includes one step buttonhole make, which is convenient to make a button hole for your garments. The sewing machine comes with a bundle of accessories, and they will be keeping in the accessory box provided in the free arm. When you want to use the free arm, you can snap out the accessory tray and engage with the stitching project. In the accessories, you will have spare bobbins, an assortment of presser feet, darning plate, needle pack and many. Are you looking for a heavy metal frame built sewing machine that can offer no vibration and skip-free sewing though out the project work? Then, SINGER 4423 is the best option fitting to your expectation. The sewing machine offers 1,100 stitches per minute and comes with 23 pre-programed stitches. You can select the stitches conveniently by just turning a stitch marked dialer knob provided on the right-side frame of the machine. The stitches are a combination of 12 decorative stitches, fully automatic one-step buttonhole maker, 6 basic stitch options and 4 stretch stitches. It is a heavy duty sewing machine, designed to meet the expectations of a professional seamstress and features with free arm sewing. For the heavy duty support, it comes with a heavy motor, which is 60% stronger than the standard motor features. For normal use, it is an ideal one as you can use it to sew anything that may come across. Mounted on a heavy duty metal frame, SINGER 1304 is one of the most affordable free arm sewing machines with incredible features. The machine is ideal for a hobbyist and a beginner meeting almost of all of their expectations. The sewing machine comes with 6 pre-programmed stitches including one automatic 4 step buttonhole maker, with easy selection action. The stitch pattern is visible in the body of the machine, and single dialer knob selector, you can select the required stitch pattern. The sewing machine falls under free arm sewing machine, and it features with detachable accessory kit covering the extended housing box of the free arm unit, allowing to use it as an extended work area. The free arm design is perfect with enough clearing area beneath the extended housing, allowing the user the sew hassle free cylindrical stitching. It is a basic sewing machine with all the essential sewing features, like automatic bobbin winder and easy threading features,etc., making your sewing an excellent experience. Brother cs6000i is a value-packed free arm sewing machine. The machine is ideal for various sewing projects including quilting projects. You can do the stitch selection including length and width adjustment by single touch operation and the changes are visible on the LCD screen. It is very convenient and helps you to make the selection quickly. The extended free arm housing of the sewing machine, beautifully augmented with an accessory box, which is detachable when you want to use around the fabric stitching or when you need to do difficult area stitching, collar, cuff, or cylindrical stitching. Free arm has enough clearing area beneath the housing portion, allowing to move the fabric freely around the housing case. While doing straight stitches, you can fix the accessory box to the free arm, which in turn give you enough work area. As the name suggests, the machine comes with 60 built-in stitches, including 7 styles one-step automatic buttonhole, to explore your creative sewing abilities. Brother XL2600i is a versatile sewing machine, specially designed to meet the daily sewing project requirements. The sewing machine is boastful about its free arm features and designed in such a way along with the accessory box. The accessory box is detachable and hence can remove to meet the tough area sewing requirements. The sewing machine comes with 25 pre-programmed stitching options, and for the stitch selection, you can find a large rotary knob with switch graphics on the front right side of the machine. For buttonhole making, it comes with 1 step fully automatic buttonhole maker, which is easy for a beginner to operate. You will have four basic presser feet along with the machine, which can use for the general purpose, zipper foot, buttonhole foot and button sewing foot. Looking to the accessory side, you will have 3 bobbins, 1 twin needle, darning plate, 3 needles (HAX130), extra spool pin and screwdriver. Bobbin loading is a cakewalk on this machine since you can simply drop it in the slot and thread will go through the needle while sewing. Transparent bobbin cover, let you watch the thread position on the bobbin. Tension adjuster is hard to manage for the right setting. 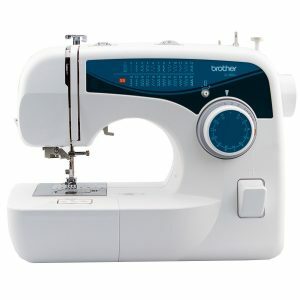 Among the lightweight category of free arm sewing machine, Brother XL2610 will be a unique experience for beginners and experienced sewers. The unit comes with a bundle of features such as built-in thread cutter, automatic need threading, and automatic buttonhole maker. The free arm of this machine is an extended housing of bobbin, needle, feed dog and shuttle with enough clearing beneath the extended arm allowing sewer to easily do sewing job that required extra care and difficult to accomplish. Once you remove the attached accessory box, the arm portion becomes slim, looks like an extension of the sewing port with free movement area, which will make sewing small tubular areas, collar, cuff, narrow end of pants, etc. The machine comes with 25 pre-programed stitches and 59 various sewing functions that include automatic 4 step one buttonhole maker. You can conveniently select the stitch pattern by turning the dialer knob to the required pattern. The dialer also features the tension regulator, which is easy to operate. All the above are the best free arm sewing machines, real workhorses, and designed to meet both professional and amateur use. We have applied a conscious effort to bring the best and budget sewing machine with free arm features, which people forget to consider while doing a purchase survey. Free arm is an important element to consider without compromising on the vitalities of a sewing machine that are essential to finish sewing projects, especially when you have to negotiate with difficult areas like, cuff, collar, tubular stitching. You will find one of the above free arm sewing machine matchings to your budget and expectations. Copyright © 2019 Sewing Machine Buffs. All rights reserved. SewingMachineBuffs.com is participating in the Amazon Services LLC Associates Program, an affiliate advertising program designed to provide a means for sites to earn advertising fees by advertising and linking to amazon.com.